Sunday, June 1: Sugar Snap Peas, Tomatoes, Strawberries, Cherries, Glorious Sunshine & The Return Of Boistfort Valley Farm! 80-11 Early Rainier cherries from Lyall Farms. Photo copyright 2012 by Zachary D. Lyons. And the hits just keep on coming! Yes, those are Rainier cherries! 80-11 Early Rainier cherries, to be precise, from Lyall Farms. This variety ripens a good two weeks ahead of other Rainier cherries, and Lyall Farms gets another 7-10 days head start on other farms because of the location of their orchard in the warmest, sunniest micro-climate in the state. Add to that the fact that, after colder than average months of December, January, February, March & April, and lots of rain to start off May, May ended up with warmer than average temps and sunnier than normal skies! Go figure. But hey, who’s complaining? 75 and sunny, with Rainier cherries, on the first day of June in Seattle? That’s fine by me! Sugar snap peas from Alvarez Organic Farms. Photo copyright 2014 by Zachary D. Lyons. But wait! There’s more! Yes, these are sugar snap peas, I kid you not! I took this photo on Wednesday at our sister Wallingford Farmers Market, which just opened for the 2014 season. These peas are from our friends at Alvarez Organic Farms in Mabton, another of Washington’s warmest, sunniest micro-climates. And Alvarez has their first harvest of Detroit red beets this week, too, and green shallots! Organic strawberries from Gaia’s Harmony Farm. Photo copyright 2014 by Zachary D. Lyons. We’ll have strawberries today from at least three different farms, and perhaps as many as six! These are organic strawberries from Gaia’s Harmony Farm. This is the earliest we have had strawberries in your Ballard Farmers Market in years! Fresh spinach from Nash’s Organic Produce. Photo copyright 2012 by Zachary D. Lyons. After their brief annual mid-spring rest, the fields at Nash’s Organic Produce in Dungeness are roaring back to life again. This week, they have lots and lots of their amazing organic spinach for your dining pleasure, as well as freshly-milled buckwheat flour and more! Hot house vine tomatoes from Magana Farms. Photo copyright 2014 by Zachary D. Lyons. Okay, now I’m just messing with, right? Nope! These really are tomatoes, grown in Washington, this year! They are hot house vine tomatoes from Magana Farms in Sunnyside, the aptly named town in the Yakima Valley that is also in one of those special micro-climates of which Washington has more than 200. Magana’s big hoop house greenhouse warms naturally using Ole Sol only. This is the same variety of tomato you see coming out of heated greenhouses just north of Bellingham in British Columbia much of the year, except they didn’t require fossil fuels to ripen, or a passport to get here, and you didn’t need a Big Box store, or a nameless, faceless corporate farm to bring them to you. Lettuce from Boistfort Valley Farm. Photo copyright 2013 by Zachary D. Lyons. Hey kids! Boistfort Valley Farm returns today to your Ballard Farmers Market, again… the earliest in years! In fact, this may be the earliest they’ve ever come in! And you can bet they’ll have lots of this gorgeous lettuce, some colorful radishes, some honey and maybe some artichokes, and much, much more. Canned local albacore tuna in a variety of flavors from Fishing Vessel St. Jude. Photo copyright 2012 by Zachary D. Lyons. It is the first Sunday of the month, and you know what that means? Yes, Fishing Vessel St. Jude is here today, with the finest albacore tuna you will find anywhere. Yay! Collard greens are back, baby! I loves me some organic collard greens from Oxbow Farm in Duvall, preferably with some lovely jowl bacon from Olsen Farms, and some green garlic from Alm Hill Gardens. Yeah, baby! Oh, and guess what? Allen is back at Olsen Farms today, too. Could life get any better? Julie from Four Sisters Gourmet Sauce. Photo copyright 2011 by Zachary D. Lyons. 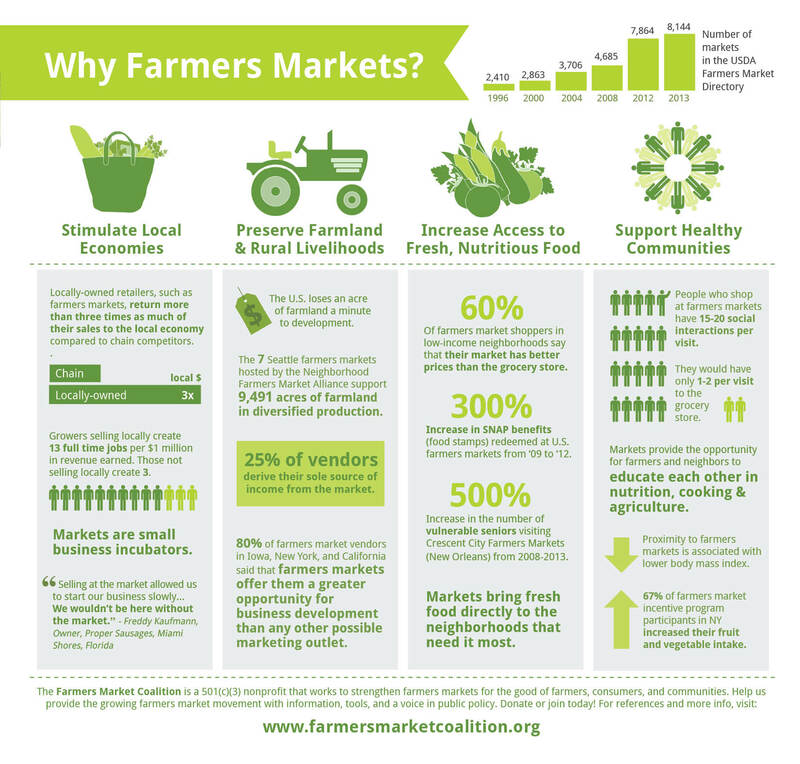 With all these farmers and crops returning to your Ballard Farmers Market, we’re running out of room for many of our beloved food artisans. You’ll find many of them at our sister markets in Wallingford and Madrona all summer, though. Today, however, is the last day at Ballard until fall for Four Sisters Gourmet Sauces. So stock up today for the next few months, while you can! Soda Jerk Truckster. Photo copyright 2014 by Zachary D. Lyons. And we finish off this week’s epistle with yet another first: the first ever vendor truck allowed inside your Ballard Farmers Market! That’s because the Soda Jerk Soda Truckster is only nine feet long, from bumper to bumper, soaking wet (as it was last week at this time), meaning it fits perfectly in a standard 10′ x 10′ vendor space. This adorable little fresh soda slinging, street-legal machine was made by Cushman in 1984, and it is the product, in part, of your generosity when you invested in Soda Jerk’s Kickstarter campaign last year. Pretty cool, eh? Sunday, February 16th: Loki’s Salmon Sliders, Britt’s Pickles, Sheep’s Yogurt & Nash’s Last Best Carrots & Sprouts! Salmon sliders from Loki Fish. Photo courtesy Loki Fish. Besides using their own salmon, Loki is sourcing many of its other ingredients from local folks like Skagit River Ranch, Samish Bay Cheese, Columbia City Bakery and Rockridge Orchards. Stop by and try one… or six… today, and let Loki, and us, know what you think! “Initial Pickle Offering” from Britt’s Pickles. Photo courtesy Britt’s Pickles. Britt’s is joining the lineup of your Ballard Farmers Market today with a wide variety of pickles, kimchis and krauts. Stop by for a sample or three! Fresh sheep’s milk yogurt incubating at Glendale Shepherd. Photo courtesy Glendale Shepherd. The hits just keep on coming! And you know what that means? Spring is just around the corner. Well, that explains the arrival of fresh sheep’s milk yogurt from Glendale Shepherd. See, little baby lambs began popping out of their mommies up on Whidbey Island this past week, and that means the ewes have begun producing their prized milk again. Fresh milk means yogurt! Enjoy! Brussels sprouts from Nash’s Organic Produce. Photo copyright 2013 by Zachary D. Lyons. Last call for Nash’s Organic Produce Brussels sprouts and carrots! Yes, it’s getting to be that time of year when we are beginning to transition from winter crops over to spring crops, but unfortunately, spring is running a bit late this year. At least you can take advantage of one last opportunity to enjoy Nash’s amazing winter carrots and Brussels. Pink Lady apples from Collins Family Orchards. Photo copyright 2013 by Zachary D. Lyons. Collins Family Orchards is still rocking their fall harvest of killer apples. I am a particular fan of these Pink Lady apples. A bit sweet and a bit tart, they are as good an eating apple as they are a cooking apple, and because they store very well, they are still great this time of year! Shiitake mushrooms from Sno-Valley Mushrooms. Photo copyright 2013 by Zachary D. Lyons. Shiitake mushrooms are great any time of year, but they may be best in winter. That’s because they are not only delicious, but they are full of all manner of healthful goodness that’ll give your cranky immune system a boost, right when you need it the most. Stop by and grab a pint or two from SnoValley Mushrooms right here at your Ballard Farmers Market! Collard greens from Stoney Plains Organic Farm. Photo copyright 2014 by Zachary D. Lyons. The cold last week may have dealt another little setback to our quest for winter greens, but not enough to stop Stoney Plains Organic Farm from harvesting some of their great collard greens this week. And speaking of giving your immune system a boost, collard greens are one of the most nutrient-dense greens around, and they’re great with bacon, too! Meanwhile, since winter cannot last forever, maybe it is time to start thinking about spring and summer gardens. Now, maybe you’ve noticed that its gotten kinda dry around here in recent years. Not so much today, but in general, it’s dry. Well, these gorgeous succulents from Phocas Farms are drought tolerant, and to make them even more so, now is the perfect time to plant them in your yard. They will get their roots set while it is still damp, and then, come summer, they will frolic along merrily, without you worrying about watering them all the time!